I don’t have to tell you that this has been a tough year for magazines and media companies. We have seen some great ones go down, including Gourmet and Southern Accents, among others. But we have built something special at Garden & Gun, and we’ve been determined to weather this financial storm by being nimble, creative, and aggressive in securing our future, and in continuing to deliver this great publication. To help shore up our business for 2010 and beyond, we recently made the difficult decision to skip our October/November issue. This was a painful thing for the G&G team, and we hate to disappoint you, our loyal subscribers. However, please rest assured that you will receive the full number of copies you ordered when you subscribed or joined one of our club levels. (We will handle that for you, so no need to call our customer service.) And know this: We will never compromise on the quality of the writing, the photography, or the beautiful paper that Garden & Gun is printed on. The next issue you receive will be a December 2009/January 2010 issue (above, right) that will be mailed to subscribers in late November (and that will appear on newsstands December 8). It’s an issue we’re very proud of, and it will be loaded with great writing, great photography, and timely content, including a special Southern holiday gift guide. In 2010, you (subscribers and club members) will receive a full run of six issues. And if you have joined the Garden & Gun Club at any level, you will receive all of the benefits and privileges for which you signed up. We hope you understand the necessary steps we’ve taken to move into 2010 in a strong position, and we trust you’ll stay with us as we strive to capture the Soul of the New South in print, on the Web, and through an expanding array of auctions and events. 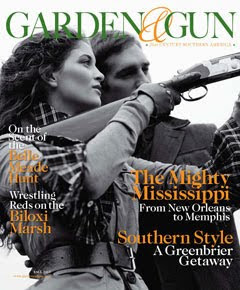 Thank you for believing in the mission of Garden & Gun, and for your commitment to preserving the best of Southern culture. I can't lose another magazine! I'm taking it personally. And this is an amazingly good one. The best new magazine I've read in years. If you care anything about The South, it's a must-read.